A 33-year-old man presented with a palpable right testicular mass. He also noted mild scrotal discomfort characterized as “achy” rather than sharp testicular pain. He denied lower urinary tract pain, erectile dysfunction, abdominal pain, weight loss, fever, or other symptoms. Past medical history revealed no prior malignancy or family history of genitourinary cancers. Ultrasound of the scrotum was ordered, which was subsequently followed by a CT of the chest, abdomen, and pelvis. Ultrasound evaluation of the scrotum revealed classic findings of multiple nonshadowing echogenic foci throughout both testicles with an accompanying hypoechoic soft tissue mass involving the right testicle (Figures 1 and 2). 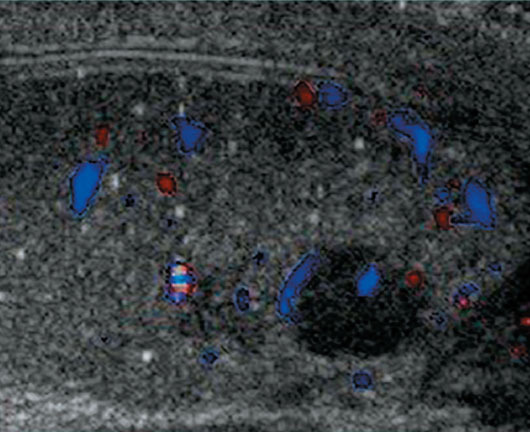 Color Doppler imaging demonstrated vascular flow within the hypoechoic mass (Figure 2). 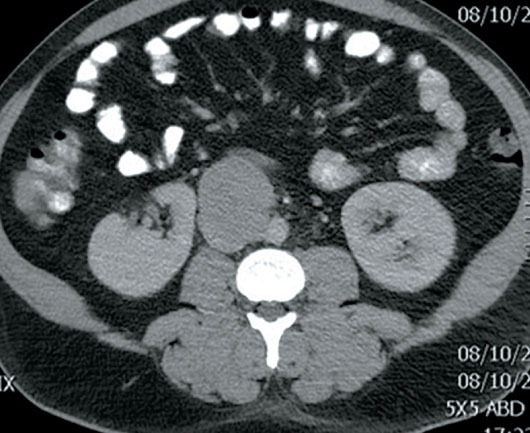 CT of the chest, abdomen, and pelvis for malignancy evaluation prior to surgical intervention revealed a retroperitoneal soft tissue mass compatible with metastatic lymphadenopathy (Figure 3). Testicular microlithiasis (TM) with accompanying seminoma with metastatic retroperitoneal lymphadenopathy. 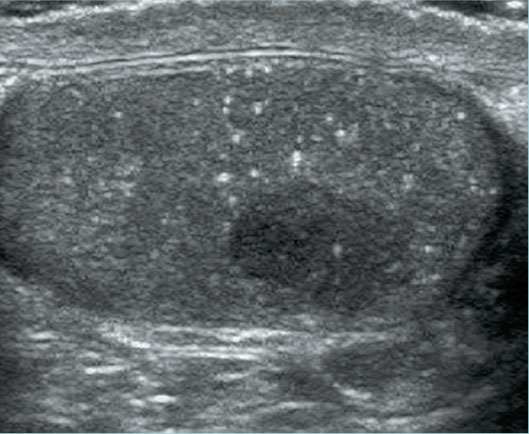 The classic ultrasound finding of TM is the presence of numerous small echogenic foci throughout the testicles. The definition of the criteria that constitute TM varies extensively in the ultrasound literature. TM may be arbitrarily divided into classic TM—five or greater microliths on at least one image—and limited TM—fewer than five microliths on all images. The frequency of sonographically detected TM varies widely among reports in the literature. Estimates of the frequency range from 0.6% to 9% in adults. The definitive explanation of the etiology of TM is not known. However, what is known is at least 20 conditions have been reported in association with TM. The reported associations include testicular carcinoma, infertility, testicular atrophy, cryptorchid testicle, pulmonary alveolar microlithiasis, and a number of other conditions. The medical literature extensively documents the association of TM with germ cell testicular tumors. Strongly worded recommendations from those studies have suggested follow-up examinations that include physical examination, serum tumor marker analysis, ultrasound, and biopsy. The management of TM detected in an asymptomatic patient has evolved. Recent recommendations suggest that the presence of TM in the absence of other risk factors is not an indication for regular screening ultrasound. For low-risk patients, all that is recommended is routine monthly testicular self-examination. The determination of testicular carcinoma risk in a patient with TM should be based upon other risk factors, which include previous testicular cancer, history of maldescent, testicular atrophy, or family history. Patients at high risk should be considered for a referral to a urologist for an evaluation and determination of an optimal follow-up strategy. — Alexander C. Schlarb is a third-year medical student at the Marshall University School of Medicine in Huntington, West Virginia. — Christopher A. Schlarb, MD, is a diagnostic radiologist at the West Virginia University School of Medicine in Charleston, West Virginia. 1. Doherty FJ, Mullins TL, Sant GR, Drinkwater MA, Ucci AA Jr. Testicular microlithiasis. A unique sonographic appearance. J Ultrasound Med. 1987;6(7):389-392. 2. Bennett HF, Middleton WD, Bullock AD, Teefey SA. Testicular microlithiasis: US follow-up. 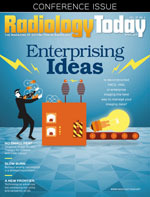 Radiology. 2001;218(2):359-363. 3. Richenberg J, Belfield J, Ramchandani P, et al. Testicular microlithiasis imaging and follow-up: guidelines of the ESUR scrotal imaging subcommittee. Eur Radiol. 2015;25(2):323-330. 4. Winter TC, Kim B, Lowrance WT, Middleton WD. Testicular microlithiasis: what should you recommend? AJR Am J Roent. 2016;206(6):1164-1169.